Featuring: Amanda Brown, Terry McDermott, Trevin Hunte, Nicholas David, Cassadee Pope and Melanie Martinez. 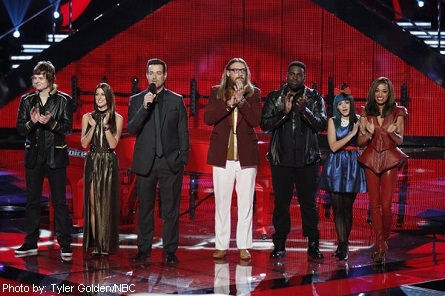 “The Voice” host Carson Daly welcomes back the six remaining contestants – Trevin Hunte, Amanda Brown, Melanie Martinez, Terry McDermott, Cassadee Pope, and Nicholas David. Daly said, “tonight the pressure is doubled.” Contestants will sing one song they picked and one that their coaches picked. “Somewhere Over the Rainbow” was Nicholas’ choice for his seconded song. 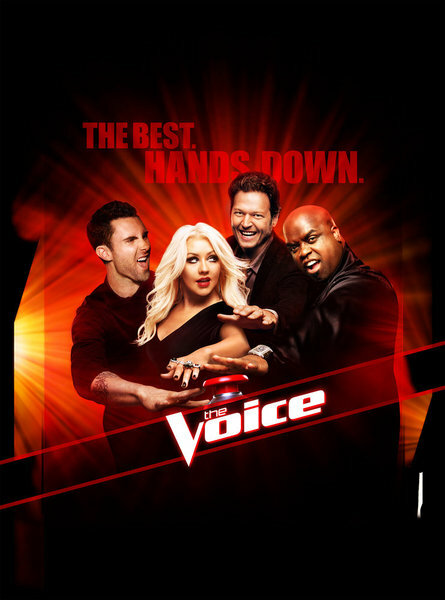 Blake said, “Cee Lo is the only one that turned around for you and that makes me feel so dumb because you are such an important part of the show.” Christina – “You are a wonderful singer. I see you gain more and more confidence. I’d like to see something changed-up here. Hopefully Cee Lo will guide you in that direction.” That was magic and that was beautiful . Only you can do what you just did. “I’m With You” by Avril Lavine is the song Cassadee picked to sing. Blake said it is one of her all time favorite songs. Adam – “I think you won us all over. I wasn’t as big a fan. Now I’m a fan again. I’m pissed off you didn’t pick me. Now I”m really pissed off. I want to see something a little more adventurous from you. (Second song) “That was my favorite performance of yours. I thought it lent itself to the show and your voice,” said Adam. Blake – “I want to continue to see you what you do perfectly. If you know that record, then you know what she just did with it. She made it her own.” (Second song) “What’s happening with Cassadee is you can’t teach somebody or coach somebody to have a connection with lyrics. She has the ability to tell a story and the ability to sing really, really good. Thank you for choosing me as your coach,” Blake said. Cee Lo (Second song) I know you can really do something when you put your hand in the air like that. You’ve had an impeccable track record. You did a great job. “Here I Go Again” by White Snake is what Amanda picked to sing for her second song. Amanda said that she chose to sing another rock song because she got a lot of requests from Twitter and Facebook followers requesting that she sing another rock song. Her last rock song she sang was “Dream On” by Areosmith. 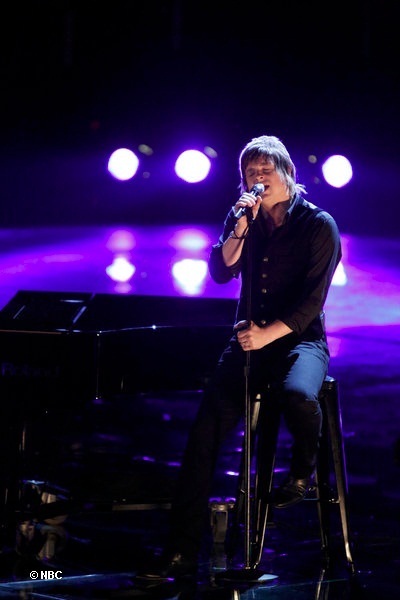 Adam – Every time I see you perform, it’s bitter sweet because I wanted you on my team. With this song there’s no where to hide. You slayed it. You did an amazing job. (Second song) You’re probably the most consistent singer throughout the entire competition. You sing the lights out. I love that song. Blake – I was right Terry. We did the right thing. Christina said you sounded effortlessly. I want America to know how hard that is. That was unbelievable. (Second song) That laser pitch you have and the passion. I often think, ‘oh my gush he’s starting it in that note.’ You just keep pushing it to the next level. You make it look easy and that’s the mark of a professional. 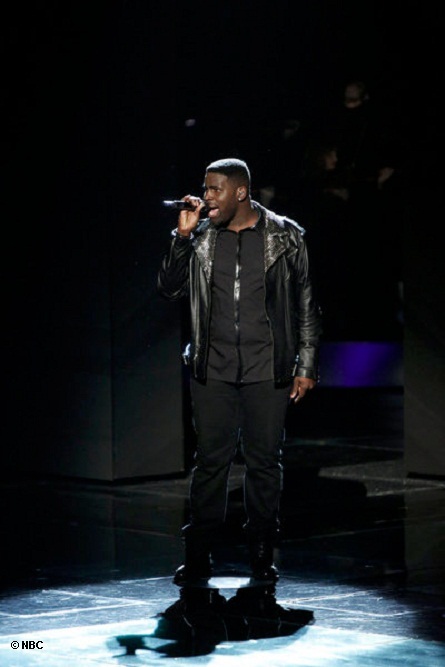 “And I’m Telling You I”m Not Going” by Jennifer Hudson is what Trevin chose to sing for his second song. Adam said, “On paper I was kinda like what? But when you walked out here. That is the genius of Cee Lo Green! Cee Lo gets all worried, but you walked out here and killed it. (Second song) “Forget about the competition. We just enjoyed an incredible, God-given voice. 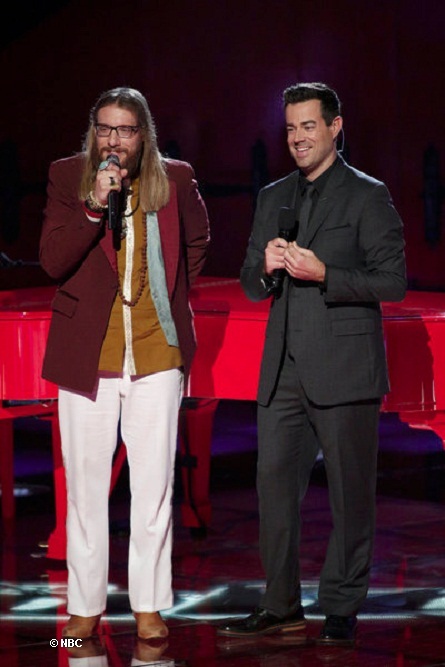 The most incredible performance on The Voice ever,” said Adam.